The MRB® III Fertilizer Application System is the most advanced and durable mid row banding system offered by Bourgault. The extensive use of well engineered cast components, convenient depth adjustment, and hydraulic engagement control will mean more time for you in the field seeding, and less time spent adjusting or maintaining. MRB® III - Detailed Features - refer to this diagram of detailed information on the superior features designed into the MRB III fertilizer applicator. The outside closer tine or retaining wheel options are available for maintaining consistent soil retention over the furrow. Floating Carbide Scraper – The floating inside scraper maintains a good furrow in a wide range of seeding conditions. Hydraulic Actuation – The hydraulically controlled MRBs are synchronized with the seed arms or shanks for efficient in-field operation. Double-Tapered Roller Bearing Hub – You can expect a long service life with the high capacity hub and spindle assembly. 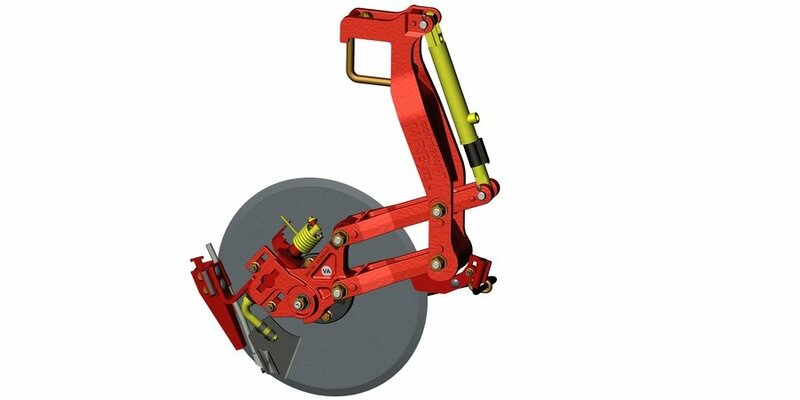 Parallel Link Arrangement – The MRB body is mounted on parallel arms for a constant disc attack angle and seed boot / liquid tube orientation regardless of its operating depth. Simple Depth Adjustment – Shims on the hydraulic cylinder are used for setting the depth. Maintenance-Free Coulter Arm Pivots – The MRB arm pivots will stand up for the life of the seeding system, even in hard or stony soils. Fine Scraper Position Adjust (Behind Cast Mount) – The position of the scraper relative to the edge of the disc can be adjusted in fine increments. Coarse Scraper Position Adjust – Adjust the whole scraper/boot assembly to maintain the optimal scraper-to-disc position as the disc wears. Combo-Boot – The versatile combo-boot allows you to select between dry, liquid, or anhydrous forms of nitrogen application. Long Wearing Coulter – The large single bevel boron steel coulter is set to open the soil just enough to deposit the fertilizer.